WWE Beast in the East is out on DVD now in the UK. Broadcast live on on the WWE Network from Ryogoku Kokugikan in Tokyo, Japan on 4th July 2015. The show features John Cena and Dolph Ziggler facing Kane and King Barrett as the main event. There's also six other matches featuring the likes of Chris Jericho, Kevin Owens, Finn Balor, Neville and Brock Lesnar in action. The WWE Divas and NXT Championships are also up for grabs. The disc includes over twenty minutes of special features, including two further matches, with Cesaro in action. Michael Cole and Byron Saxton provide the commentary. Chris Jericho and Neville kick-off the action, with a rare broadcast match for Jericho, that works as superb opener. Jericho and Neville connect quickly in the ring to provide a pure wrestling contest, to provide flawless action, that is buoyed by a lively Tokyo crowd. Unfortunately a Diva's Champion triple threat with Nikki Bella defending against Paige and Tamina can't keep up the quality and quickly becomes a sloppy, botch-fest. After Brock Lesnar squash Kofi Kingston, the before match pageantry of Finn Balor and Kevin Owens' NXT Championship collision is a nice touch and get's over the importance of the match for anyone who might not follow the NXT Brand. The bout is typical of the action found on the NXT Takeover event, with Owens and Balor going full pace in a superb bout that has the Tokyo crowd hooked from start to finish. The match of the show for me, Owens put on a terrific character performance as well, adding to the conclusion of the contest. The post-match celebration and numerous replays are highlighted by an appearance from WWE Hall of Famer and 6 time IWGP Heavyweight Champion, Tatsumi Fujinami. Prior to the main event, Michael Cole does a decent job of putting over the four performers various storylines, although this only stand to highlight just how random this combination of guys is at this point in time. John Cena and Dolph Ziggler teaming to take on Kane and King Barrett is heavily hurt by a feeling of anti-climax, after the emotional contest between Balor and Owens that went on before it. However, the action is all decent and the lengthy contest gets a strong reaction from the live crowd, who are heavily into Cena and Ziggler as a babyface tandem. 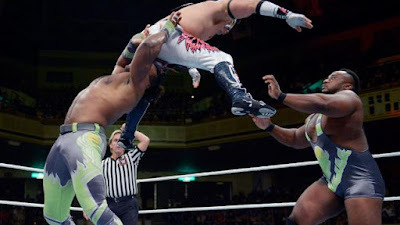 In the sleeper contest of the entire disc, Cesaro and Los Matadores' Diego put on a fun outing, with some nice spots and plenty of involvement from Fernando and El Torito throughout the bout. Lucha Dragons and The New Day's Big E and Xavier Woods also have a decent tag team clash, with Kalisto and Big E impressing. This was a top quality event and for anyone who has decided against signing up to the WWE Network then this should be the top of your list of DVD releases (especially considering that it's not being released in the USA). Balor vs. Owens won our July Match of the Month poll, whilst Jericho and Neville also featured in the top three. Even if the rest of the card is sketchy, the opportunity to see Brock Lesnar and a different style of main event, as well as two exclusive bouts, make this more than worth your hard-earned cash. Even if that's just to piss of the Americans. Amazon and Amazon Market Place are currently offering the best price at £11.99, but the disc can also be purchased online from WWEDVD, Hive, Base, Zavvi, ebay.co.uk and Blackwells.